Staying true to the style of attacking your front row, Vermillion returns to do so once more. 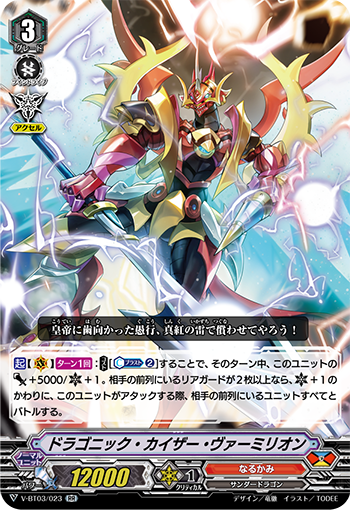 ACT (VC) 1/Turn COST [Counter Blast 2], and this unit gets Power+5000/Critical+1 until end of turn. If your opponent has two or more rear-guards in the front row, instead of Critical+1, this unit battles all of your opponent’s units in the front row in one attack. AUTO (RC) When placed, choose up to one of your opponent’s rear-guards, and move it to another open (RC) in the same column as that unit. If you did not choose, this unit gets Power+3000.